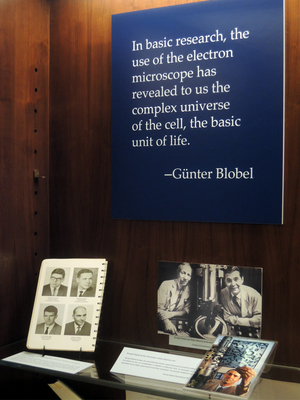 Günter Blobel joined the Rockefeller laboratory of George Palade (1912-2008) in 1967. Palade, who received a Nobel Prize in 1974, discovered ribosomes, the cellular elements that manufacture proteins. In the 1960s, Palade’s laboratory worked out the pathway by which some proteins are secreted from cells, starting with their synthesis and ending with their exit from the cell, but the underling biochemical mechanisms remained unknown.